State Troopas are members of King Koopa's Koopa Pack and are a variety of Koopa Troopa. They were featured in The Super Mario Bros. Super Show! 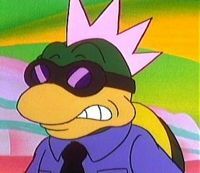 episode "Toad Warriors", where they acted as King Koopa's corrupt police force and soldiers. State Troopas have a somewhat odd, punk style appearance, having large, pointy and pink mohawks, dark sunglasses and shirts with ties. State Troopas also utilize various amounts of equipment, such as Bob-Ombs, projectile spitting Cobrats and vehicles seemingly made of junk, such as barrels and toilets. The name State Troopa is a portmanteau of the words Koopa Troopa and state trooper, a type of police officer. This page was last edited on March 20, 2019, at 19:08.